The most valuable dataset has access to all possible data. This means collecting data in a variety of ways with flexible collection tools. The Tealium Universal Data Hub is the only data platform giving you a comprehensive set of tools to collect data, no matter the technology or customer touchpoint. 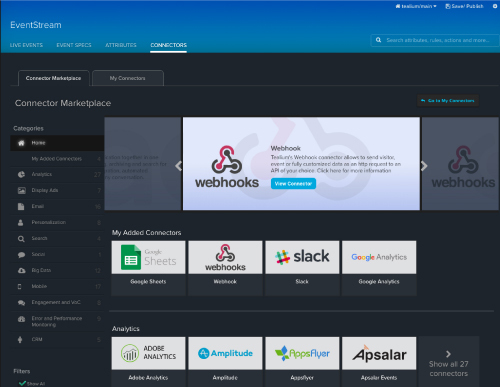 Manage data server-side using cloud infrastructure with a comprehensive set of code libraries, SDKs, APIs and our marketplace of pre-built connectors available through the UI. Mobile data presents unique challenges compared to legacy data collection. Make sure to take a unified approach so you don’t create new silos to overcome down the road. When data can’t be collected directly at the source, use our flexible Omnichannel functionality to bring in visitor data from other enterprise sources, such as offline sales data. Tealium supports FTP/SFTP, Amazon S3 and Microsoft Azure file transfer services. 3M’s journey with Tealium began with Tealium iQ Tag Management to comply with EU cookie management regulations, but quickly exploded from there to include the Universal Data Hub. The Insights & Analytics team uses Tealium to support the business process for behavioral and attitudinal measurement systems at the enterprise level.